No matter the type of party you are throwing, there is a a tent for every occasion. A tent creates an incredible blank canvas for your event, so you can decorate the areas as you see fit. Tents also offer shelter from the elements, whether you’re seeking shade or protection from rain. Think about the event you are hosting and find a style of tent to correspond. Tents come in several different styles and sizes. Think about the location of your party, the events you have planned, and the size of your guest list. If you are having a large number of people attend your event, consider a large tent to provide plenty of room for tables and chairs to accommodate everyone. If you are having a smaller event, or an event with several different activities going on at once, think about renting several different small tents. Protect games and food stands with a tent. Don’t forget about the size of the venue. If you’re having a party at a country club or park, be sure to get measurements of the land. You don’t want to rent a tent that is too large for the space you have. At Pink Elephant Party & Tent Rentals, we have several different types of tents for our customers to choose from. Think about a frame tent for smaller events, tailgating, or fundraisers. A pop-up tent is another option that is quick to assemble and provides accommodating shade on sunny days. For events taking place in grassy areas, a pole tent is an ideal choice. We also have high peak tents to catch eyes, color tents to match party themes, and tent accessories. Purchase a heater to keep your party warm on a chilly day, sidewalls to keep the wind out and offer privacy, or tent lighting for a unique ambiance. 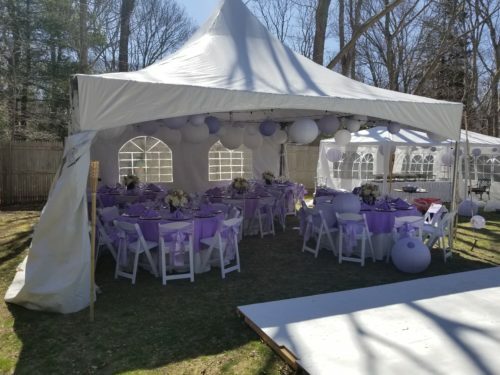 Learn more about how Pink Elephant Party & Tent Rentals can accommodate your event by calling us at 631-357-3561 today!